When you’re busy in school, you don’t always have the time to schedule regular hair appointments. But once you have a haircut at State Street Barbers, you may change your tune. We’re proud to offer student rates for men’s haircuts in Chicago, and when you come in, we’ll get you set you up with our special Gentleman in Waiting signature cuts that will have you looking a cut above the rest. When you’re looking for the best barbershop experience in Chicago, you can find it at State Street Barbers. Some barbershops make you feel like you’re not a priority, but at State Street Barbers, we make you feel like a king. Our comfortable chairs are just the beginning of this experience. 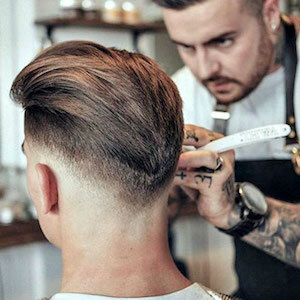 Your haircut will also include a scalp shampoo and condition, a straight razor neck shave, and a shoulder massage for the ultimate in comfort. You can also enjoy a hot cup of coffee or tea while you’re here. 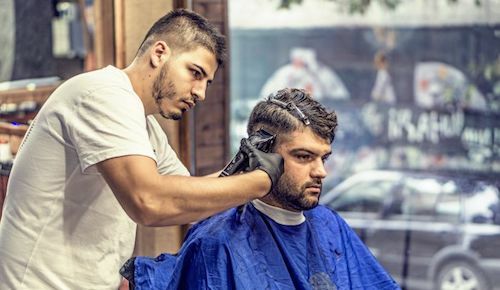 When you come to State Street Barbers, you’ll not only leave with a great-looking haircut, but you’ll love your time spent here. With four locations across Chicago—in Old Town, Lincoln Park, Lakeview, and River North—we’re easy to find and even easier to book with. Simply schedule an appointment with one of our professional barbers online, or give us a call. We also offer beard trimming and shaping services as well as grey blending services, so no matter what you need to feel your best, we can do it. We know that as a student, you’re busy working hard, and that’s why we’re happy to offer complimentary services between appointments. This free clean-up neck shave gives you what you need to look sharp and feel confident. To book your appointment with one of State Street Barbers’ professional barbers, simply call or click "Book Now" above.